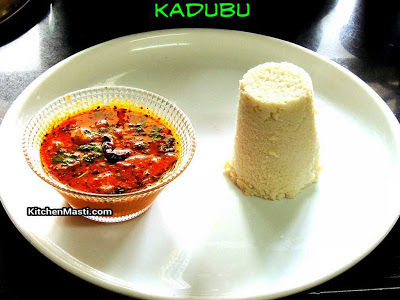 Well, this dish is well known among South Indian breakfast lovers and it goes on well with coconut chutney and Bombay saagu. 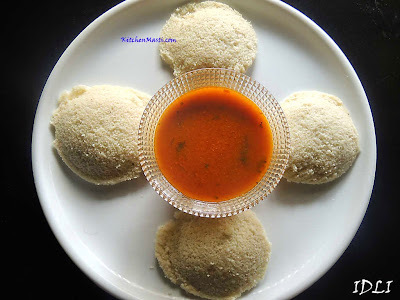 If you are not ready with the idli batter but if it is on your priority list, then you are on the right page because I will be posting this instant rava idli without any fermentation. 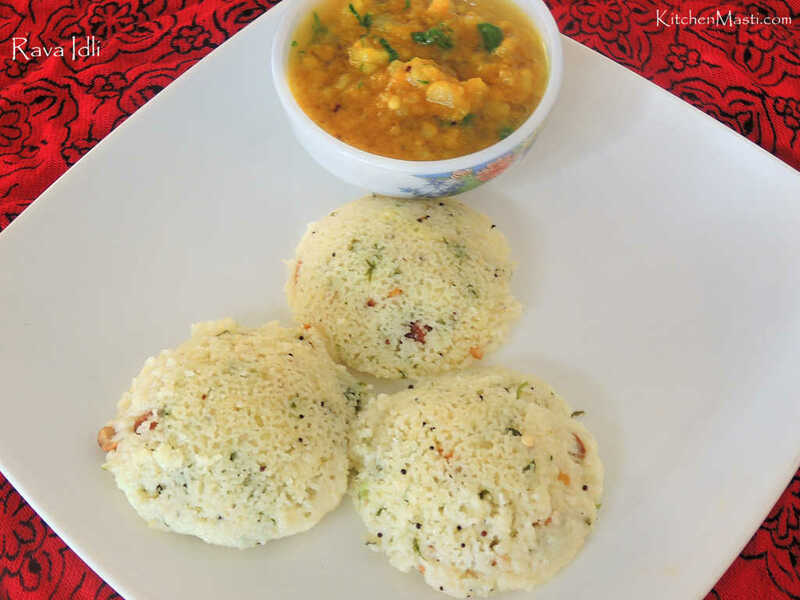 Here, we mix medium rava ( semolina ) with curds and steam it in the idli cooker for soft and fluffy idlis. Idlis are one of the healthiest breakfast for all the ages - old, young, kids and even for the sick ones since we steam it. It is very easy and simple to prepare. The time taken to prepare this dish is around 30 minutes and the quantity mentioned here is enough for 3 servings. Curds ( yogurt ) - 1 1 / 2 cup. Red chilli ( byadige ) - 1. Cashew nuts - 7 to 8. Heat a big deep pan or kadai with oil in it. Add broken red chilli, channa dal, urad dal, mustard seeds and chopped curry leaves into it. When it splutters, add medium - rava and mix it on a medium flame for around 5 minutes. Now, add the curds and mix it well. Add chopped coriander leaves and coconut scrapings into it. Heat an idli cooker with water in it. 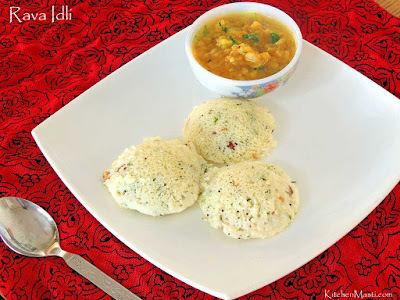 Meanwhile, grease the idli moulds with ghee or any other edible oil. Now, add eno's salt into the idli batter, mix it well and pour it immediately into the greased idli moulds. Steam it for around 8 to 10 minutes. 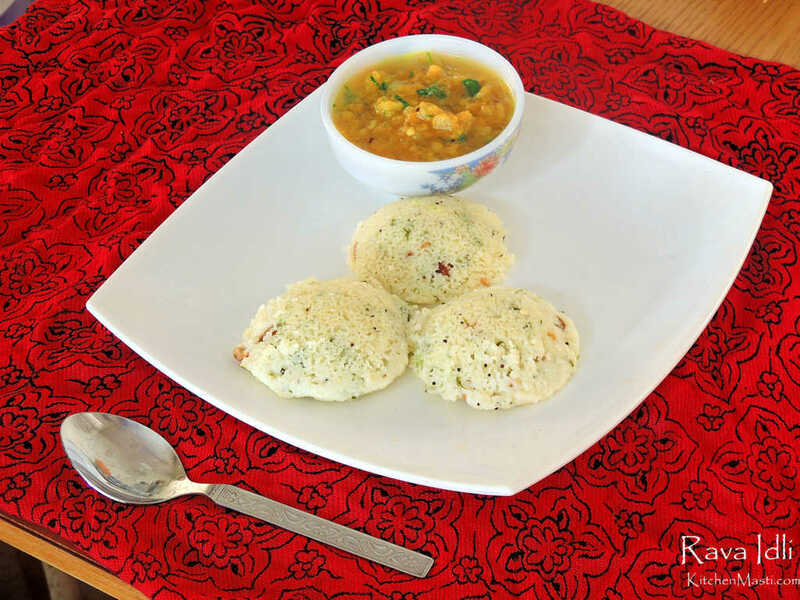 Your soft and fluffy instant rava idli is ready to be served.!!!!! Always use curds for soft and fluffy idlis. Never substitute curds with water. After adding eno's salt, steam it immediately. You can add grated carrots in the batter for an attractive color but it is optional. 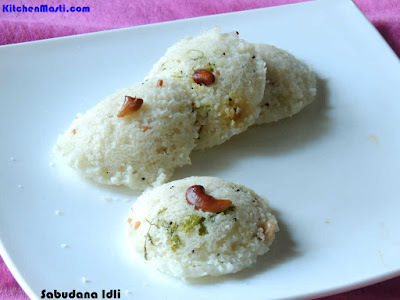 See to it that the curd is not too sour, or you may end up with sour idlis. You can substitute eno's salt for baking soda. How much soda to add please?